The goal for this trip was to bag a few peaks on the central Great Western Divide (GWD) and to revisit the lovely Cloud Canyon-Colby Pass area. 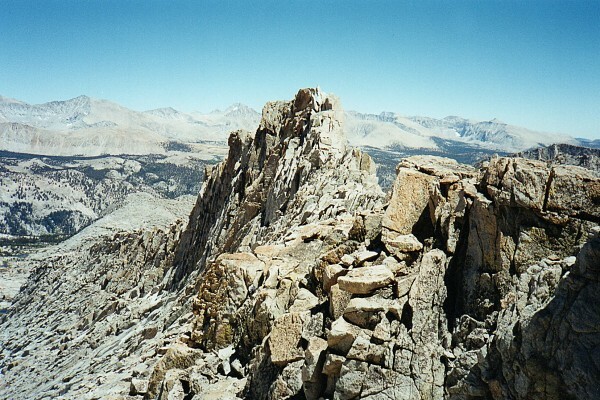 My first goal was to survey the GWD from Mitchell Peak, an excellent vantage point on the western border of Kings Canyon National Park. I got a very late start, hitting the trail at Marvin Pass trailhead at 11. Upon reaching Marvin Pass, I headed for Mitchell Peak. At the turnoff to the peak I realized that it was too late in the day to climb it and also make it to Roaring River Ranger Station before dark, so I continued up the trail to Kenawyer Gap where I stopped for a lunch break. 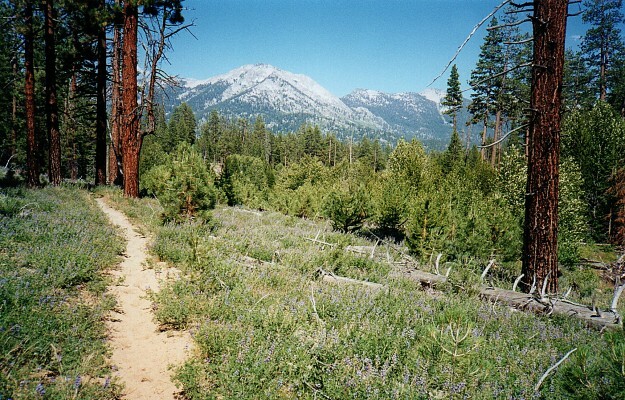 From Kenawyer Gap, the trail descended through mixed conifer forest punctuated by meadows. I took another break next to an ice-cold stream before dropping into Williams Meadow. I turned east at the trail junction and reached Comanche Meadow in a few minutes. The sandy trail continued east past the Sugarloaf. This hunk of granite is a remnant of bedrock left behind by glaciers that made their mark in this area. Shortly after crossing Sugarloaf Creek, I scared a beautiful black bear that ran away so fast he tumbled head over heals. A half-hour later, the scene repeated itself when I scared up another bear, this one a lovely cinnamon. The trail continued through mostly dry forest and over glacial outwash that had washed in from the valleys to the south. Sandy Trail near the Sugarloaf - Mushy glacial outwash makes for tiring walking between Marvin Pass and Roaring River. The trail climbed after crossing Ferguson Creek. As I made the descent into Roaring River canyon, I could see Milestone Mountain in the distance. I arrived at the Roaring River Ranger Station at 6:30 where I talked with Roaring River ranger Cari and visiting ranger Bob about climbing routes on the GWD. 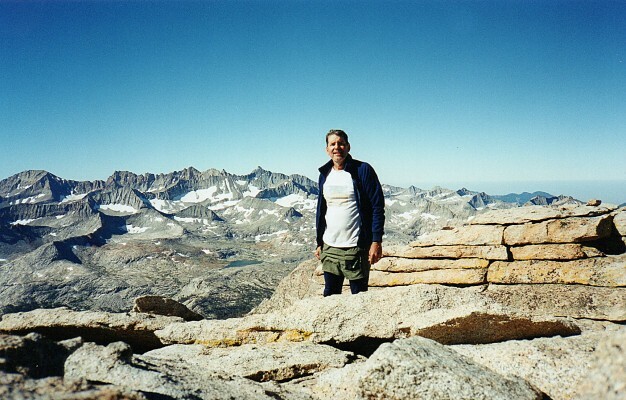 I found a camp near the bridge and the bear box which I shared with a couple of guys from the San Diego area I had met a few years earlier while on the John Muir Trail near Tyndall Creek. They claimed I had recommended the route into Roaring River when I had talked to them during that trip. Small world. The next day, I was determined to get as close to Milestone Mountain as I could. The trip up Cloud Canyon was pleasant and before I knew it, I was in Cement Table Meadow. There were a couple of tents near the river but I didn't see anyone outside them. Perhaps their occupants had gone up to Josephine Lake for the day. As I crossed Cunningham Creek, I entered territory I had never traveled before. Soon, I was taking photos of flowers in beautiful Big Wet Meadow. Big Wet Meadow - Wildflowers were at their peak, there were no mosquitos to speak of, it was clear and pleasant. What more could I ask for? Big Wet Meadow can be magical place. The massive Whaleback dominates the view to the south. This lovely place, which has a reputation for lots of mosquitoes, was relatively free of them on this day. I continued up Cloud Canyon to the upper end of Big Wet Meadow where I forded Roaring River to its west side. The canyon steepened, passing by some lovely falls and through lush, miniature, trailside meadows. The trail split after it recrossed Roaring River. A cross-country route continued up Cloud Canyon, but I left the canyon and ascended the Colby Pass Trail. It was easy to follow the trail as it contoured around the northern end of the Whaleback but staying on it became more difficult after reaching a rocky meadow below Colby Lake. Finally, I arrived at Colby Lake and found that I was very tired, even though it was only three in the afternoon. 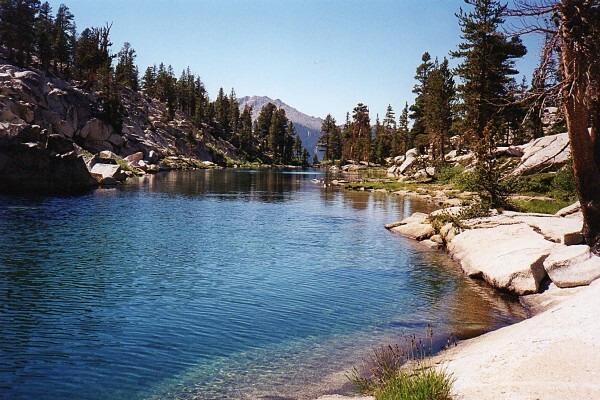 Outlet of Colby Lake - Perfect campsites can be found near the outlet of Colby Lake. Fish were jumping about the time I took this photo. The water was crystal clear with a multitude of shades of green and blue. I set up camp and napped for a few hours before enjoying dinner and a great sunset light show. I hadn't seen another soul since leaving the Roaring River Ranger Station that morning. The next morning, I followed the trail to Colby Pass where I dropped my pack. 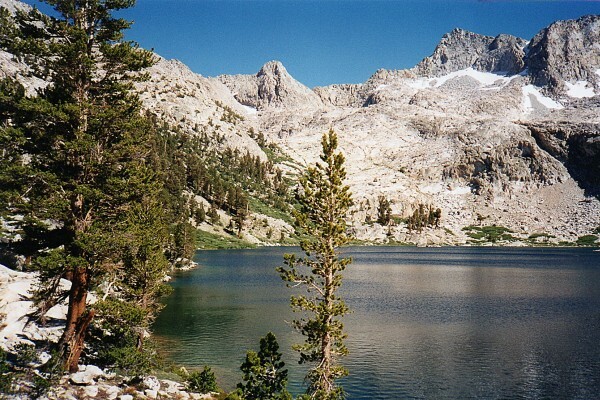 Upper End of Colby Lake and Colby Pass - Colby Lake is one of those special places in the Sierra Nevada. It's close to timberline and remote. 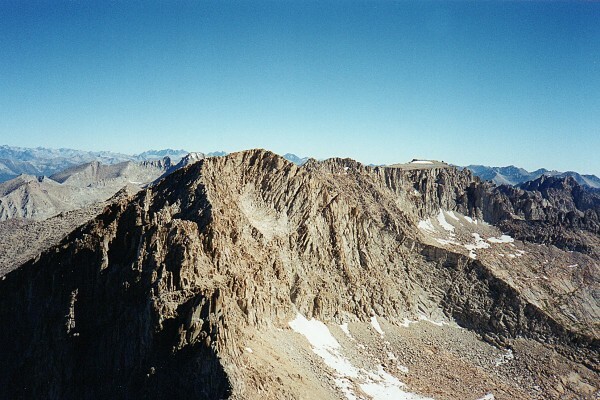 I contoured to the east and ascended Centennial Peak from which I had a great view of Milestone Mountain and Pass. Milestone Mountain and Pass from Centennial Mountain - I got a good look at what I was to face: Milestone Pass that afternoon and Milestone Mountain the next morning. I returned to Colby Pass to find that a rodent had visited and partially consumed my pack while I was gone. Fortunately, the damage was minor. The pica or marmot was just trying to get a little salt from my salt saturated pack straps. I descended the trail down to a small unnamed lake where I left the trail and ascended through Milestone Bowl toward Milestone Pass. The route was relatively easy until I reached the steep section just below the crossing. I picked the wrong notch and had to work my way north before crossing into Milestone Basin. The pass seemed much more difficult than the two previous crossings I had made. I concluded that I must be getting old. I spotted a flat area across the talus fan under Milestone's east flank and made my way there. An ice-cold spring bubbled out of the talus near my camp and provided me with delicious water supply. Despite its lofty elevation, the area made a great camp and I enjoyed a great night's sleep. The next morning, I was up early and eager to give Milestone Mountain my best shot. Milestone Mountain from the East - This is the view I had as I began my ascent of Milestone Mountain. I used the route pioneered by Norman Clyde. I climbed the talus fan to the north ridge that projected from the summit. Soon I was slowly negotiating the class 3 ledge that gave access to the low point on the north ridge. Once I had crossed the ridge, I made my way along the north side of the mountain until I found an easy place to cross to the ramp that led to the summit. I was surprised at how easy the ascent to the summit was. I had envisioned a narrower ramp, but the trickiest part of the entire climb had been approaching the north ridge. After enjoying the fantastic views and signing the register, I took a few photos, including a self-portrait. 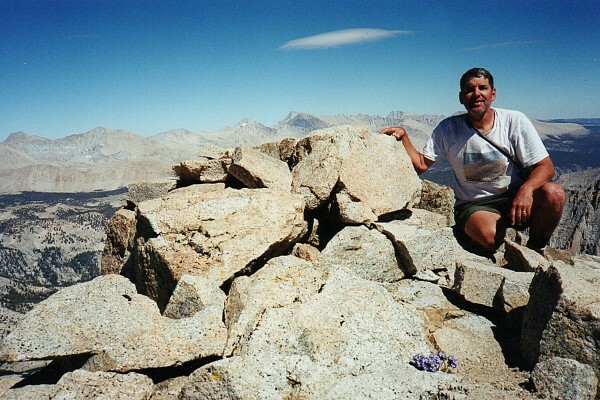 View from the Summit of Milestone - Here's a picture of the happy hiker in front of his favorite set of rocks, the Kaweah Peaks in the far background. My next goal, massive Midway Mountain, stood to the north. 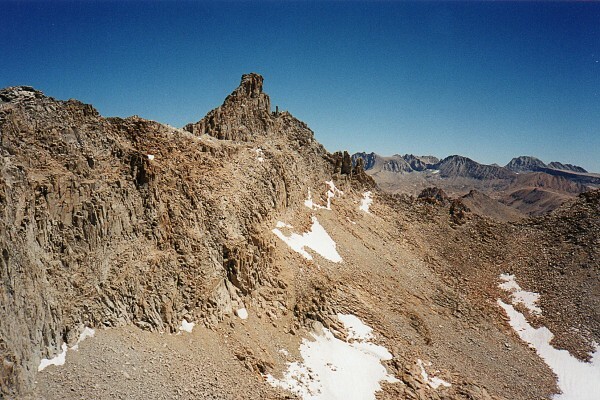 Midway Mountain from Milestone - Since Massive Midway Mountain is not technically difficult, it is "put down" by many guidebook authors despite the fact that it is the high point of the Great Western Divide. That's a shame, because it has excellent views of the region. On the way down, I descended the ramp too far and ended up having to do a little exposed rock scrambling on my return to the north ridge. Renegotiating the class 3 ledge was a lot less worrisome the second time around since I knew the climb was over once it had been crossed. (Upon my return home, I was delighted to read that my hero, Norman Clyde, had pioneered the route I had taken.) The return to my camp was uneventful. I took more photos of alpine vegetation then left to climb Midway Mountain. I headed for the east ridge of Midway, which involved quite a drop in elevation. As I rounded the east end of the east ridge, I was surprised to see that there was no route actually on the ridge itself, at least not one that I wanted to take. I contoured around the ridge until I reached the large gully that leads to the large window on the east ridge. 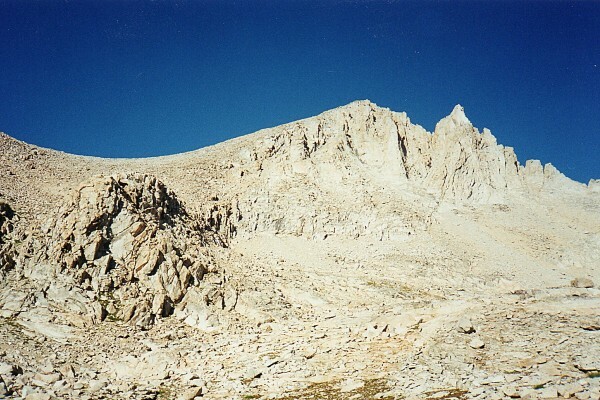 East Ridge of Midway Mountain - The guidebooks says take the east ridge to the summit. Yeah, right. I guess that means follow the east ridge on its north side then ascend a gully to the summit massif. That's the way I did it. Once at the window, the route to the top was fairly obvious. The final climb to the summit was long but uneventful. Views from the top were easily as fine as those from Milestone. I set up my tripod and took a 360 degree panorama. Lenticular clouds formed above the Sierra crest to the east. Midway summit - I forgot to wear sunscreen for a couple of days and badly burned my face and arms. Note the lenticular cloud (no, it's not a UFO) in the background and the bouquet of sky pilot in the foreground. I enjoyed a meal with flowers at my feet. The summit remained windless during my entire visit. The gentle, gravelly slope of the north side of the mountain was easy to descend. I checked out the pass between Midway and Table to see if it was a reasonable crossing. The pass looked pretty steep on the east but it's very easy on the west. 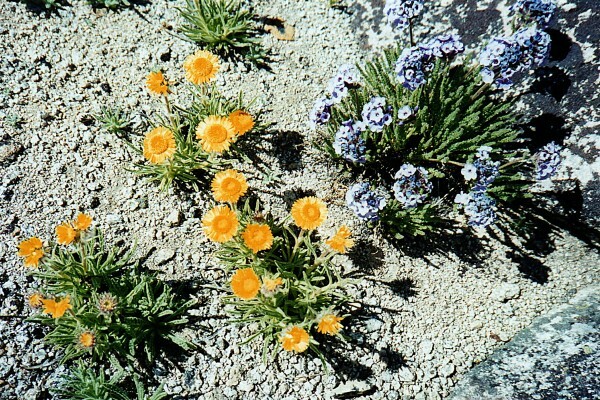 I continued my descent westward, still on loose decomposed granite and through a sparse garden of alpine flowers. Sky pilot Polemonium eximium and alpine gold Hulsea algida were scattered on the west slope of Midway Mountain. 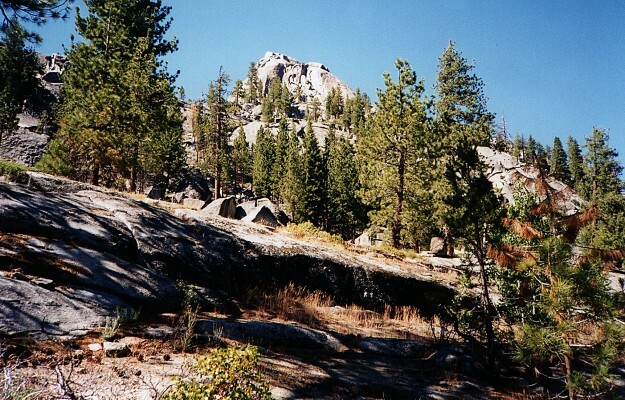 The slope became steeper and eventually I had to climb down granite slopes and talus fans. Eventually, I was funneled into a drainage that turned out to be the hairiest part of the route. It took a while to pick my way down the dry waterfall that I had been drawn into. Once I had found my way down, the going was very easy. Looking back at Midway, it looked like it would be a pretty easy ascent from the west. Midway Mountain from the West - There is easy route finding on the west side of Midway which has an easy approach from Colby Lake. I walked past a couple of tarns then dropped into the valley containing Colby Lake. Shortly after crossing a small swamp, I was back at my campsite of night two. Smoke began to build up in the valley and I worried about making it out the next day. I got an early start on my final day because it was going to be a long one, 25 miles ending in several miles of uphill hiking. I encountered the first signs of other visitors as I passed a couple of tents in Cement Table Meadow, but I didn't see anyone around. Finally, at the Grasshopper Drift Fence, I met the first people I had seen since leaving Roaring River Ranger Station three days earlier. They were the first members of a group that was headed up Cloud Canyon for a weeklong holiday. I arrived at the ranger station in the early afternoon where I prepared my big meal of the day. 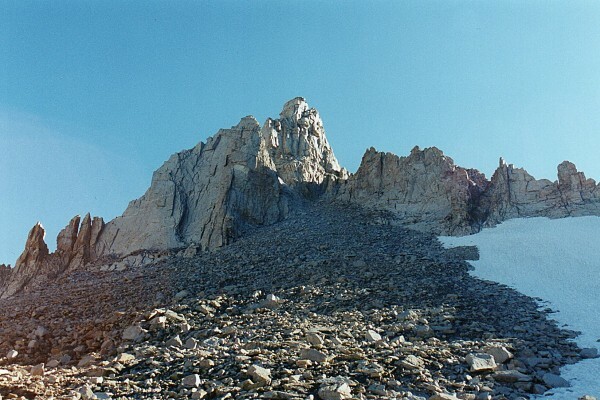 While cooking, I struck up a conversation with three hikers who had just climbed Glacier Divide from Deadman Canyon. We hiked together for Sugarloaf after I finished lunch. They decided to stay in Sugarloaf Valley that night but I had miles to go before my hike was over. The remaining trail over glacial outwash required patient walking. Long strides were impossible on the mushy trail surface. 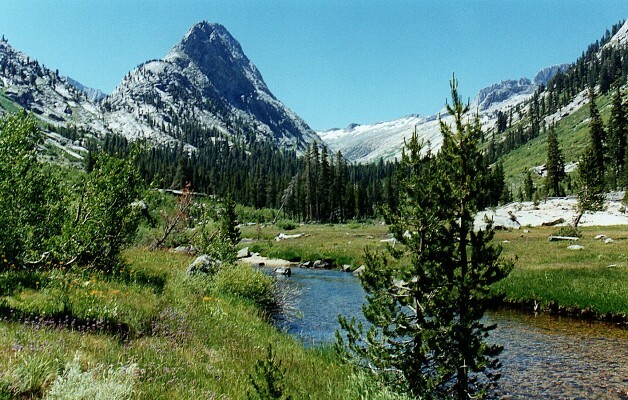 I cruised by Comanche Meadow and began the final ascent to Rowell Meadow. On the steepest part of the trail, I was startled by a sudden commotion behind me. I stepped off the trail as two cowboys on horseback galloped up the trail on their way to the meadow. It was dark when I reached the turnoff to Marvin Pass. As I took a short break at the trail junction, I could hear a noisy party at the nearby packer camp. I made my way to Marvin Pass by moonlight. I made the final mile to the trailhead by flashlight.